A very important part of a SEO consultant’s work is to analyze the competition, both offpage and onpage. The analysis below is only for offpage. The process is not complicated, you just need to extract some data, and after that, to analyze and interpret them. 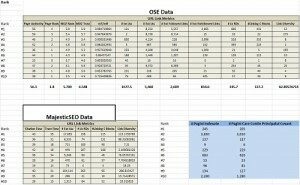 For this analysis I used OpenSiteExplorer (OSE version free account) and MajesticSEO (paid version). This analysis is the best I have ever found. It is not an exact one, it can’t be, because there is no tool that shows the exact number of links and root domains of a website. To track the competitors, I used Keyword Search Rankings, to identify the websites that appear in the top for 15 cities in Romania. I found 4 websites that appeared in the same order for all the targeted cities in top 4, and the other 6 websites appeared randomly positioned in searches. For all the analyzed data I have done an average to consider. I intent to get a competitive word on the first page in SERP and I need a target : number of links, number of root domains, percentage dofollow/nofollow, sitewide links, number of Class C IPs and so on. If you take a look at the first competitor and you’ll see a large number of links, root domains is likely to be intimidated. If you do an average of 10 competitors, you’ll notice that the things change a lot. Not all competitors have got tens of thousands of links, but on the contrary some are positioned with far less. Pro Tip: Analyze the competitors in top and with the fewest link, because they are doing something well. You should not limit yourself to the data that I have extracted, you can extract any other data. You can also use any tool that you know. Data are not 100% accurate, these analysis are made to get a better idea on the competition. The analysis looks like this: Unfortunately I extracted the anchors from OSE with my free account. With free account you can still get some numbers but not all of them. I managed to get the numbers for exact match anchors, because they were used more often. Those numbers were not the exact ones. 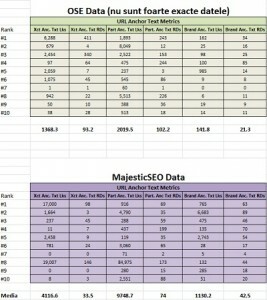 I extracted some numbers for brand match anchors and the partial match anchor text I got it after I substracted from the total number of links the ones with exact anchor text and brand anchor text. For each data set I made graphics, for both OSE values and MajesticSEO values. – All competitors have attracted links that pass value to the Hompage, with great Authority, PA and MozRank. 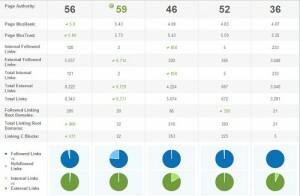 PR is quite low at most sites and this might be caused by the not so good quality of the links. – MozTrust is quite high for the Homepage of all sites. At the first glance that thing tells me that these are qualitative links, but after I compared with Majestic TrustFlow I realized things are different. The explanation is that MozTrust is passed from other linking domains, gathered from other links and has grown a lot. – Analyzing MozTrust/MozRank I have noticed that the links are spammy. Ration should be above 1 and I haven’t found this at any of the analyzed sites. – There are not many internal links because the sites are small, around 200-400 pages. Adding relevant content would definitely help and this can be done through the blog. 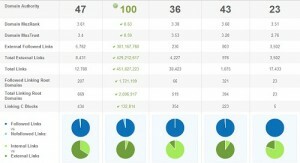 This way the the notion of FreshRank will show up and number of internal links will increase. – Nofollow links are few, that means they don’t have to be a bother. – The average of the external links is not that high and it can be reached. The same happens with the average of Root Domains. – Analyzing data from Majestic I have noticed that although there is a large number of links and Root Domains towards Homepage, Trust Flow is quite small. The average is about 20, which means it’s pretty small. – The same happens with the average of different IPs, which is not very high. Below is the data extracted from OSE for the first 5 competitors, from left to right in the order of Google Rankings. The analysis is for the Homepage. – The website that ranks first has many exact match anchors, in both the number of links and the number of Root Domains. Any SEO who takes a look on this links, will probably consider it an abuse with bought links and that is possible to rank lower. – The number of brand anchors and brand anchors links from Root Domains is smaller than I expected. This is a good thing, meaning that I can bring towards the site, partial anchors that include the brand and keywords or just the brand. – There are many partial anchor links and domains that offer this kind of links so that should be one solution for my website. – The authority and trust of the domains are not as high as I expected them to be and also the links towards internal pages (deep links) are few. – Regarding DMR/DMT, the situation is a little better, there are more values over 1. 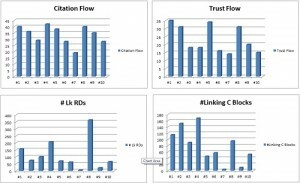 Citation Flow and Trust Flow for the domains are much smaller compared to DMR and DMT. It’s up to the indexes of every tool. From my point of view, Majestic is better for this part of analysis, given the fact that it works with many data and it is, ones again, from my point of views, very trustable. – The number of Root Domains and Class C IPs is not as high as I expected. Below are the data extracted from OSE for competitors, in the order that they rank in Google, from left to right. The analysis is for the whole domain, and the second one is for WordPress.com . The model used for the analysis is the one used by SEOmoz for KW difficulty. It can only be accessed from the PRO accounts. 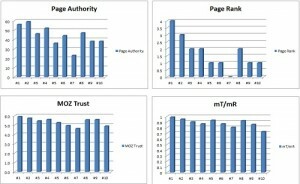 SEOmoz parameters: http://www.seomoz.org/learn-seo – here you can find everything you need to know about their metrics (PA, DA, MozRank, MozTrust). MajesticSEO parameters: http://blog.majesticseo.com/development/flow-metrics/ – here you can find everything you need to know about Citation Flow and Flow Trust. You can download: the complete analysis from here. Further reading: in this article you’ll find a competitive analysis presented by Rand Fish back in 2010, among with some other SEO tools. I hope you enjoyed this article and I invite you to share it with your friends or to subscribe to the rss feed to receive other articles too. What are the EMDs and how we can use them to get high quality organic traffic?